And honestly... I was pretty let down. It was okay. Definitely not worth 50 minutes each way along I-5. Highlight was running across these two on the highway. 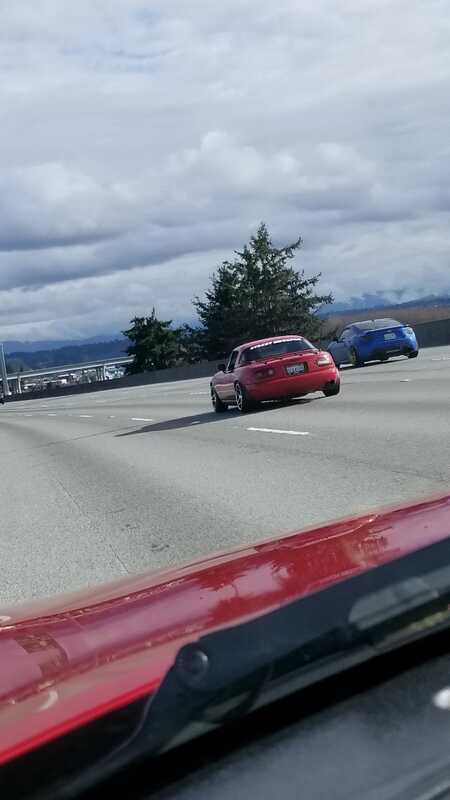 Boosted Miata and what looked like an autox focused Brz build. Here’s a quick video of the road. It’s not bad... It’s just... There are much better driving roads in Washington. To put things in perspective, even with my winter tires I could have hit triple digits numerous times. The curves are all veeeery gentle, and aren’t a whole lot of fun unless you’re willing to risk imprisonment. And as far as scenic routes go, I’d give this a 5/10 maybe a 6. Looks like there’s some great hiking though! Tl:dr - skip Chukanut Drive. Highway 2 offers better driving and views, Mt. Rainier offers significantly better driving and views. Hell, even Tolt Road has better canyon carving, albeit without too much in the way of scenic stops.